The First Phase of the Rose Valley Heritage Garden and Veterans Memorial is complete. Read about the dedication ceremony here. 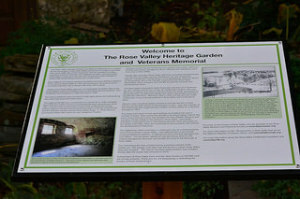 To see a copy of the Landmark Display that gives the background on Rose Valley and the gatehouse, click here. Promote resident participation and volunteerism by involving most of Rose Valley’s existing organizations involvement in planning, executing and dedicating this project. Phase One is estimated to cost less than $15,000 to install. A structure known as The Gatehouse, once part of the Saul Estate (aka Rose Valley Farm,) used to stand at the intersection of Old Mill Lane and Rose Valley Road. This structure was constructed on top of an existing springhouse sometime in late 19th century. The structure was found to be structurally unsound and not appropriate for renovation into a modernized single-family home. 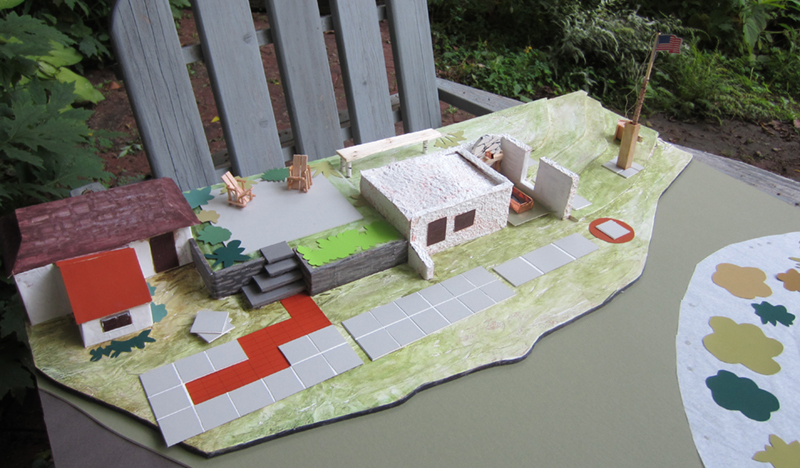 The Borough did not wish to see the historic springhouse razed for construction of a new home. In 2010, the developers of Traymore, who owned the property at the time, demolished the upper levels of The Gatehouse and donated what has been come to be known as the Gate House Ruins along with an additional ¾ acre of ground to the Borough of Rose Valley. The existing garage and patio were left intact. The Rose Valley Folk has undertaken the expense of stabilizing the springhouse by placing a concrete cap over it. The garage is currently in use as a storage facility for Rose Valley’s Boy Scout Troop 272. The garage was beautified by resident volunteers, but no plan was in effect for the long term maintenance of the ruins. The stucco, which once covered the stone foundation, is now coming off the structure due to its exposure to the elements and our recent severe winter. Volunteers have been doing occasional weeding of the gardens, which were planted by a former tenant of the Gatehouse. The Gatehouse Ruins joins 40 acres of Borough-owned open space. One space, Pew Park, has several trees which have been planted in memory of individuals who have had an outstanding impact on Rose Valley. There is no room for additional memorials of this kind in Pew Park.